WASHINGTON — President Obama’s new call for proposals to deter gun violence — and his pledge to push those proposals through Congress — sets up the prospect of an intense debate over gun rights and the Second Amendment next year. The president also endorsed new congressional efforts to revive a ban on military-style assault weapons, as well as new restrictions on high-volume ammunition clips. In past years, gun rights advocates have questioned the effectiveness of gun control legislation. They say many proposals violate their Second Amendment rights to gun ownership. As for the politically powerful National Rifle Association, Obama said its members are “mothers and fathers” also affected by the Newtown tragedy. “There is a big chunk of space between what the Second Amendment means and having no rules at all,” he said. The NRA and guns rights groups have said little since the Newtown shooting. The NRA declined comment on the Obama-Biden project. It has a news conference set for Friday. This incident may trigger a change in the NRA’s policy toward gun control, said Jon Vernick of the Johns Hopkins Center for Gun Policy and Research. One of the most significant changes would be requiring universal background checks for all gun sales, he said. 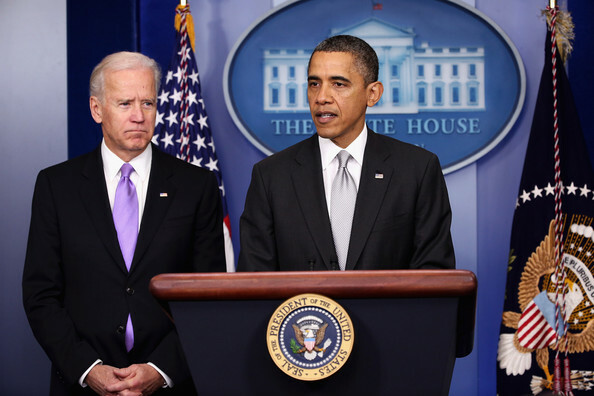 Congressional Republicans indicated a wait-and-see approach to what Obama and Biden develop. Biden’s task involves dealing not only with potential new gun laws, but also with mental health and cultural issues. Obama said he picked Biden because of his experience in the Senate, including authorship of the 1994 crime bill that included an assault weapons ban that lapsed in 2004.